The Scam that is Detox! It occurred to us the other day that there is a word being bandied about, that doesn’t make sense. How can a shampoo “detox” hair, especially since hair is dead matter anyway? How can a detox kit make anyone loose that last frustrating inch of fat that just will not go away? Something is very very wrong – indeed it’s true, the word “detox” has been hijacked! In the world of medicine, detox has only one meaning – it refers to weaning addicts off drugs, alcohol or eliminating poisons that have been ingested/injected. In alternative medicine the word detox has been come to include pills, powders, supplements, kits, diets, magic drinks, colonic irrigation, and yes, even shampoos and body brushes. What is troubling is that, no two companies selling “detox” products use the same definition (as say – crazy thought here – outlined by the Oxford English Dictionary). 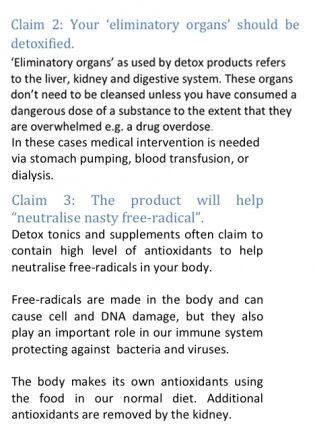 Conventional detox can be life saving; in alternative medicine, detox is a scam. Detox products refer to the large number of toxins anything from cigarette smoke, exhaust fumes and pesticides to caffeine, alcohol and medicinal drugs. They talk of how these accumulate in the body, and of the extra burden this places on our natural detoxification mechanisms. And they point the finger at this toxic overload as being behind a host of ills including constipation, bloating, flatulence, poor digestion, heartburn, diarrhoea, lack of energy and fatigue. “…at worst, some detox diets could have dangerous consequences and, at best, they were a waste of money”. There’s a grain of wisdom in detox diets, according to Jackson-Blatner. It’s true that the average person doesn’t drink enough water or consume enough fruits and vegetables. Detox dieters may report a variety of benefits, but none can be traced to the idea of detoxification. Fewer headaches can be traced to other lifestyle changes such as reduction in alcohol and caffeine intake. Clearer skin can result from improved hydration, and less bloating could be a result of eating less food. Some detox dieters report a boost in energy and even a sense of euphoria. But doctors say that the feeling — also commonly reported by people who are fasting — is actually a reaction to starvation. It likely evolved as a way to help a person evade threats and locate food. There’s something to be gained from avoiding large quantities of alcohol, smoke, junk food, or anything to excess, Moderation is best, but these regimens are anything but moderate. The use of laxatives in detox diets also raises red flags among dietitians, as laxative abuse is commonly associated with eating disorders. The belief that laxatives are useful for weight control is a myth, the National Eating Disorders Association notes. In fact, laxative abuse can cause severe dehydration and heart or colon damage, the association says. Detox diets promise a quick fix, but are in fact just another scam. “You can change your life in 10 days — but not through the Master Cleanse. Instead, use those 10 days to make the transition to a balanced diet with lots of fruits and vegetables — and then stick to that diet for good.” Says Peter Pressman, MD an internal medicine specialist at Cedars-Sinai Medical Center in Los Angeles. He adds that the science behind the detox theory is deeply flawed. The body already has multiple systems in place — including the liver, kidneys, and gastrointestinal tract — that do a perfectly good job of eliminating toxins from the body within hours of consumption. In other words: If you are in eating foods which are bad, a branded pill or juice cannot save your liver from alcohol, your lungs from smoke or your face from make-up, pollutants in the air or over exposure to the sun.. If you eat naturally the body will take care of itself and if you do fill it with toxins there is no miracle cure to remove them that’s left to your over worked specialist detox organs. All you can do is avoid those things known to be toxic such as alcohol, tea and coffee (in ecxess) and anything with caffeine in it. Real “evils” are the big bad tripple score “whites” white flour, sugar and yes … salt. Too much dairy, all processed and junk foods, all processed carbohydrates such as white bread and pasta are also on that list. Instead of “detoxing” just try doing some of these: Eating raw vegetables, unsweetened fruit juices, brown rice, lean chicken and turkey, fish and drink plenty of water and you will be getting healthy foods that put a minimum of strain on your organs. Milk thistle to help liver function, soy BIO-K to boost probiotics in the gut. In conclusion: Your body can detoxify itself but you can help with healthy living, thus aiding your organs to do what they were designed to do without the help of a pill. When it comes to detox products, in the words of Simon Singh and Edzard Ernst from their book Trick or Treatment; “the only substance that is being removed from a patient is usually money”. Related sites worth the read here and here. I know from experience that losing weight requires not merely discipline but a long term commitment to a change in life style. I’m eating everything I ate a year ago but managed to lose 11 kg. I am drinking more water of course but I’m walking or riding my bicycle instead of my car. That, I believe, has been my real detox. As we have always believed – this is more about a way of life than a diet. Diets don’t work … just like detox doesn’t work. Anythign short term and extreem just can’t. What I found most interesting is that detox is used for other things not even related to dieting and weight loss. 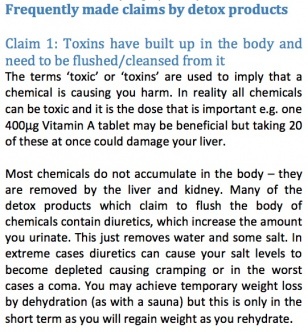 Detox is a word used in hair shampoo, face creams and other things you don’t even injest! That IS weird and makes no sense. Thank you for the great article. I will follow you via RSS. We enjoyed your blog, but be warned – we don’t believe in dieting. On principle dieting is for the short term and it simply does not work. What we do believe in is a healthy permanent way of living. Change the habits. Change the life. Change your body. It’s slow and steady but also permanent results. If people are unwilling to do a long term permanent change – it’s a yo-yo pattern that is very very bad for the body. Sugar free – you will soon find out is almost impossible today – unless you are willing to make everything from scratch. We recommend you shift your language and goal to sugar avoidance. It’s a “when you can” scenario. Also far more attainable and goal’s are always more likely to work if attainable. What do YOU mean by sugar? Because fructose and carbs are sugars. But we need them. Carbs are very good for you and should be consumed in large quantities and this is another major problem we have with “diets”. Carbs however, should always be consumed for breakfast and lunch and never afterwards. It’s not always what you eat but how much and WHEN. After a hard weight training workout at lunch – a big bowl of pasta is precisely what the body needs – carbs allow you to stay awake and think! An hour later have some protein. Now back to the sugar question. We all have a sweet tooth. In this world where kids are bombarded with ketchup, soft drinks, muffins and other crap from an early age – it’s hard not to. What we suggest is look at the natural sweets. Fruit are good for this, some berries and a ripe mango for example are lovely, juicy and sweet. Dried figs, dates and raisins within reason are excellent. If you really can’t handle it – we sometimes have 3-4 squares of 70% cocoa chocolate. Other snacks are nuts and best of all seeds. Popcorn is the best snack BUT we recommend you get the kind you pop yourself in the pan, not the microwave kind. We pop ours with a minimum of oil and of course because it’s not prepackaged there are no preservatives and … no salt (another evil white). Start looking at what you are eating and see how much sugar is in it. Most times your better off learning how to make it yourself and thus – cut the sugar down or out. Muffins and breakfast bars are basically cake, bread is a pastry …. Etc. The only way to get over a sweet tooth – making it a pleasure rather than an addiction – is to go through the pain of addiction withdrawal. There’s no way around it and it takes 6 months. If you persevere it’s well worth it and you’ll spend the rest of your life wondering what the big deal was. You need to adopt a tough love approach for this. Having a buddy or partner to hold you accountable helps. Realize that it’s an addiction and that addictions take time to get over. You will fail – more than once but keep at it. Once you can do it unbroken for 6 months – you are in the clear. Why 6 months? that’s how long it takes to create a new way of life. We hope this helps and thank you so for the comment and question! (Note: We are not nutritionists, not experts – but have been living a very healthy life for a very long time and have had enough experience to sift the myths from the facts – still … we are not “qualified” on paper to be giving this advice without disclosure). Thanks for the post – I think I’ll add your article to my blog. Thank you – as long as you give us credit we are more than happy! Have your thought about adding some social bookmark buttons to your site? At least add one for Digg so we can digg you up! We will look into it – thank you for stopping by. In my opinion, detox is a good thing but it should be done with careful approach.